Could You Use Some Parenting Help? I will be the first to admit, that yes I can! I am an older dad with two young daughters (12 and 9) who are both strong-willed and quick to share opinions. Occasionally this all comes together in a perfect storm–if you get my drift! And I confess to not always handling those storms in the right way. So certainly I can always use some more information on how to parent better. 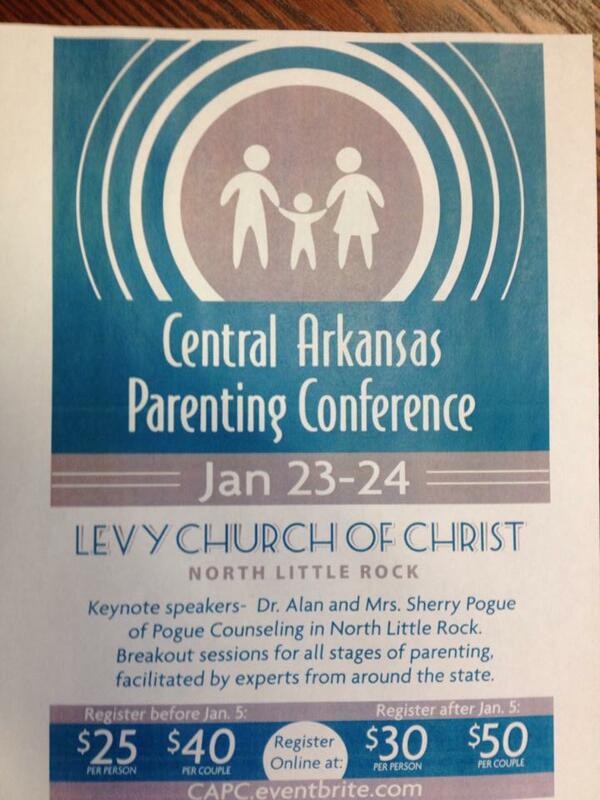 This is what the Central Arkansas Parenting Conference held at the Levy Church of Christ in North Little Rock, Arkansas on January 23-24 is all about–sharing information to encourage better parenting. My wife and my go-to people when we need parenting advice are Christian counselors, Dr. Alan and Sherry Pogue. Fortunately for me, Alan is a shepherd at my church and both he and Sherry have helped us on numerous occasions with solid counsel and wisdom from their experience and education. They are keynoting this conference and will bring that wisdom and experience with them. If it were just them alone this would be a must-attend event, but there is much more. If you are anywhere near Central Arkansas, I urge you to strongly consider attending this special weekend event. You can look over the entire schedule and register at capc.eventbrite.com or you can register at a congregation of the churches of Christ in the Little Rock/North Little Rock area. I first met Stan Williams at the Woodward Park Church of Christ in Fresno, California. We were both there to participate in their Spiritual Growth Workshop a few years ago. Stan immediately welcomed me, embraced me and made me feel like we had been friends for life. Since then we have become friends for life. It is just that way with Stan. Stan has spent his life, his energies and his heart serving God and his people. He preached at Woodward Park for several years during which they realized incredible growth. Stan is one of the best evangelists I have ever known. Over the course of his ministry he has been a visionary and demonstrated almost indefatigable energy for the sake of the kingdom. 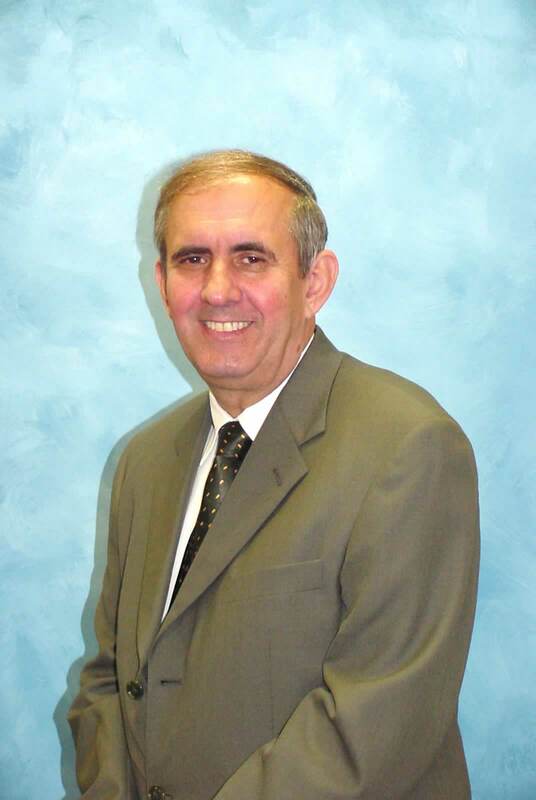 More recently he has served as the preaching minister for the Lassen Street congregation in Vallejo, California. I had the privilege again to see Stan there in May as he helped his church host a wonderful workshop. His smile was as bright as ever, but his body was weakened by an ongoing struggle with colon cancer. As a result of this disease Stan is having to retire from active ministry. While the prognosis looks good, he simply is not able to continue serving at the level he is accustomed. Like many other ministers who spent their life emptying themselves for others, Stan never thought much about retiring and now is faced with some financial challenges as he makes this transition. The Vallejo church has committed to assist Stan and his wife, Sherrie, but because of costs related to health care and insurance needs still remain. Word is spreading among friends of Stan. Our brother needs our help. The Woodward Park church has agreed to process any assistance by individuals through the “Williams Assistance Fund” at this address: 7886 North Millbrook Avenue, Fresno, CA 93720; attention John Ed Clark, elder. The Sherrod Avenue church in Florence, Alabama (where Stan’s son, Kerry preaches) is processing assistance by congregations at this address: 1207 Sherrod Avenue, Florence, AL 35630; attention Kerry Williams, minister. Stan is a mighty soldier of the cross and I know that regardless of whatever challenges he now faces- he will face them with strong and unwavering faith and with a smile that cannot be diminished. I also know that others will be blessed everywhere he may journey. That is just the way it is with Stan. Last weekend (March 26-27) I attended my first ever Elderlink event. It was held at the North Atlanta church. I greatly enjoyed the focus, resource speakers and especially the interactive nature of the event. It was great to see old friends and make new ones. I caught up a little with old Mississippi friend, Tom Perkins. Tom is now the Involvement minister and worship leader for the University Church in Tuscaloosa, AL. He is one of the best at the latter I know! I got to know Steve Watson a little more. Steve is the preaching minister at the Campus View church in Athens, GA. His brother, Scott, is one of our elders at Gateway. I wish I could be around Steve more. And I enjoyed a long lunch with Jerry Neill. Jerry is the preaching minister at the Meadowbrook church in Jackson, MS. This was my first opportunity to spend time around Jerry. I enjoyed it. He is a great minister and thinker. It also was blessing to be around David Fleer. David is a professor at Lipscomb University in Nashville and one of the forces behind Elderlink. I respect David a great deal. He loves preaching and preachers. Any event with his hand print on it will be an incredible experience. The trip up to Atlanta with Gateway co-workers and friends and the time spent together with brothers and sisters at the event were all great blessings! I really enjoy blogging- both writing and reading. It is one of the better usages of the world wide web. My problem is being able to do it consistently. I marvel at guys like Bobby Valentine, Matt Dabbs, John Dobbs, Trey Morgan and others who are able to maintain quality posting. Just in case you did not know the last two mentioned will be co-teaching a couple of classes at the Tulsa Workshop on Christian blogging. Should be interesting. Unfortunately I will be unable to attend. Blogging (much like other things- say- working out at the gym) is about time management. Lately my time has been managed for me- between family, ministry and my MMin. work. But I am not complaining. This weekend my daughter Taylor turned seven. She is a Valentine baby and we celebrated at a local pet store (Yes, pet stores host b’day parties now) which was fun. She also had her ears pierced- which dad was not quite ready for! At Gateway, we have seen an increase in benevolence requests. We have set up a task force to deal with this and to redefine our focus in this area. Early this morning one lady- whom we had been helping- from the homeless community was found dead under an oak tree in front of our building. Often we feel quite overwhelmed in our efforts to address the needs that are out there. Later this month we will be hosting the President and First Lady of Lipscomb University, Randy and Rhonda Lowery. Rhonda will be spending the weekend as the resource speaker for our annual Ladies Retreat and Randy will speak to us on the following Sunday. For my latest class in my MMin. program, I am writing a research paper on how the divorce of a preacher effects a congregation. I am discovering that there are not a great deal of resources available on this topic. As always- thanks for dropping in! It has been a couple of weeks since I posted. Of course I blame busyness. Since I posted I made a trip to Greenville to celebrate (along with my sisters) my mom’s eightieth birthday. I performed a wedding ceremony on Pensacola beach of a young man I saw grow up in Mississippi- Xan Spencer. His bride is gorgeous. And I have spent many hours with my head in books for my latest class from Harding. All in addition to normal stuff at church and with family. Now I am in Nashville at a sermon seminar at Lipscomb University. Very good stuff on the first night. I am part of a “cohort” group. Les Ferguson, Jr., Cecil May III, Allen Coker, Sam Garner, Brad Adcock, Danny Halman and a new friend, Clyde Slimp are also in this group. My buddy John Dobbs was supposed to be with us, but his step-dad is critically ill in New Orleans. Please say a prayer for this family. As always- thanks for checking in. It was another top notch lectureship on the amazing campus of Pepperdine University! The classes and keynotes (in particular Don McLaughlin and Jerry Taylor- they are awesomely gifted) I attended were relevant, challenging and informative. The worship each night led by Ken Young and Hallal was simply powerful- at times moving me to tears and at other times lifting me up in joy-filled praise. Hats off once again to Jerry Rushford and his crew for hosting this breath-of-fresh-Pacific-ocean-air and Spirit-filled event! For Terri and me the experience was somewhat bittersweet. After doing a such a marvelous job in our class- despite her doubts and anxiety- Terri received a phone call on Wednesday night from her dad informing her that her grandmother was not expected to survive the night. So we spent Wednesday night making arrangements for Terri to fly to Arkansas on Thursday. She was glad we did since she then spent some quality time with her grandmother. Her grandmother has rallied a bit but remains in very critical condition and is not expected to leave the hospital. Please pray for her- Emil Dale. At the lectures I ran into some old friends and acquaintances whom I had not seen in years. My old Magnolia Bible College pal, Rick Jannelle was there. Rick is now preaching in Shillington, Pennsylvania and loves it. I saw fellow Pine Grove Church of Christ alumnus, Glenn Newton who was a presenter and who currently preaches at Lakeview in Tacoma, Washington. Terri and I were delighted to see Christina Guy. Christina was a college student and one of our translators in Vilnius, Lithuania. God providentially arranged her move to England where she met and married missionary Nathan Guy. Nathan is now a Bible professor at Harding University and was a presenter. And it is always a joy to visit with Tom Perkins. Tom is on staff at the University church in Tuscaloosa, Alabama. He was there with the praise team he leads. He is a gifted worship leader. I ran into fellow bloggers Steve Pucket and Bobby Valentine (who- as usual- taught a great series of classes. The guy is a genius!). I had the chance to visit with Lipscomb professor David Fleer about their upcoming Sermon Seminar in October. I visited briefly a couple of times with Terry Rush, who besides being a dynamic preacher has a tremendous ability to remember names. Terri and I chatted with Sara Barton who is from the same hometown as Terri (Melbourne, Arkansas) and who serves as a campus minister at Rochester College. It was nice to see Doug Edwards again. Doug is excited about his new work with Camp Manatawny . It was likewise good to see Daniel Jolliff who is now preaching for the Simi Church of Christ in Simi Valley. CA. And it was such a blessing to see old friends, Ronney and Slyvia Wheeler again. I enjoyed lunching with them and meeting a group from the congregation they now serve at the foot of the Superstition Mountians in Phoenix, AZ. Of course part of the joy of the entire trip was spending time with fellow Gateway folks, Mark Stark, who is our involvement minster and Bud Myer who is one of our shepherds (and the president of Global Christian University). The without-a-doubt highlight of the entire journey was on Thursday night as Mark and I witnessed Bud baptize his Vietnamese foster son in the Pepperdine swimming pool. I did miss somehow meeting Bobby Ross from the Christian Chronicle. I did attend their luncheon and chatted with Lynn McMillon, but missed Bobby. I also missed connecting with fellow refugee from the Missisippi Delta and blogger Tammie Hacker. One other highlight for me, but of a different sort- was sitting in the sun on a gorgeous day with the Pacific ocean in the backgroung and catching a few innings of Pepperdine baseball. Their 13th ranked team put on a baseball clinic against the team from San Diego in the early innings I enjoyed. I will say it once again- if you get the opportunity to attend this event in the future- take it! In my opinion it is one of the most uplifting and encouraging events among the Churches of Christ. The president of the university, Dr. Andy Benton, shared the university’s commitment to our brotherhood and in his words celebrated our heritage. Not only was this great to hear, it was great to experience. You are currently browsing the archives for the Lectureships category.